It's that time of year again: camping season! Before you load up the truck with snacks and smash ball, let's talk essential items. While each camping trip is different, we recommend starting each excursion with some basics. We offer a range of high-quality camping products, whether you're headed to the mountains with friends or taking the family out for a holiday weekend. Check out our most recommended must-haves below. We aren't worried you'll forget one, but choosing the right kind of tent for your trip will be a vital part of your overall experience. With so many kinds of tents on the market, it can be difficult to narrow down your best options. That's why we've done the work for you. We've tried and tested our products for quality and effectiveness and have concluded that either a basic dome tent or an instant pop-up tent will suit most beginner campers. These tents are true to their namesake because they pop up into a dome shape. This means that, unlike with an a-frame tent, you're in for a pretty roomie experience. These tents aren't made for walking around in, but unlike some single-sleeper tents, they still offer plenty of room to breathe. At 4.5 feet high and 8 feet wide, this tent provides enough room to sleep four people, but we certainly won't judge anyone who's looking for that Weasely camping experience. Dome tents are painless to assemble and break down, and are light and compact for easy transportation. 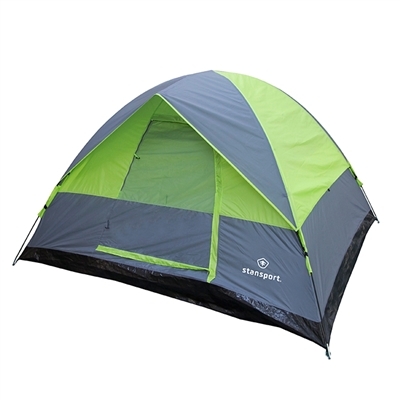 Because these tents are free-standing, you can assemble them completely before staking them into the ground. You should stake your tent securely on all four sides to prevent it from blowing away as soon as a gust of wind comes your way. 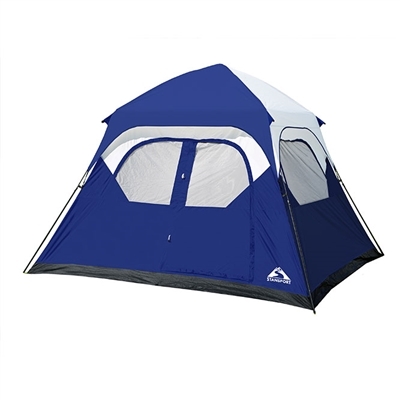 instant tents featuring an articulated frame will require more than one person. The more people you have, the easier it is to set one of these up. With the help of your family, your instant tent can be completely up and running in just two or three minutes. A tent like this will easily sleep six people. These homes away from home are a perfect combination of comfort and the outdoor experience. At 6-feet tall, they offer enough room for most people to walk around in, and the ten by nine-foot floor space provides plenty of space for cots, mattresses, and any additional gear you might want to bring in with you. The advantage of an instant tent is, of course, its unparalleled convenience. However, this tent will not be for you if you're looking for a backpacking experience, you're traveling alone or you're setting up in windy conditions. Unless you're camping in your own backyard, you'll need to pack your gear in a car or truck. As survivalists, we naturally prefer the minimalist approach, but we're sure you'll agree that having adequate seating room for everyone on your trip is ideal. 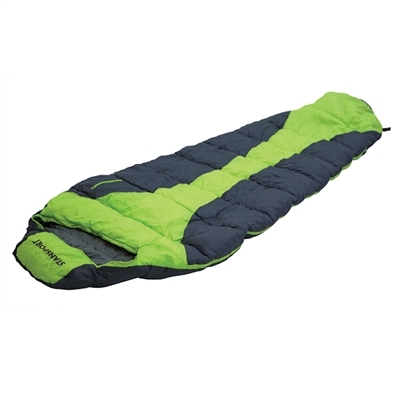 Sleeping bags are light and compact, they roll up neatly and you can squeeze them virtually into any corner of your car. Depending on how much you're willing to spend, sleeping bags easily fit into or onto your pack, giving you a hands-free experience if you're hiking to set up camp. At higher altitudes, summer temperatures can easily still drop into the 30s and 40s at night. Covering yourself back to front in a comfy cocoon will ensure you don't shiver through the night and wake up stiff and miserable. Choose a sleeping bag appropriate for the weather by checking its temperature rating. We offer summer, winter and three-season bags. Finally, a proper sleeping bag will still keep you warm even when moist or wet. Although you may not be planning on rain, when camping, it's better to be prepared for the worst-case scenario than not. Nothing will ruin a camping trip faster than being underprepared for the weather. If you're camping for more than a night, a stove like this will be an absolute essential. Unlike a camp fire, these flames are predictable and will help you prepare more than just s'mores. Temperature control is pretty difficult with an open flame. We get it, a camp fire is one of the backbones of the experience, but we recommend saving the open flame for warmth and light. The temperature control on a portable stove will allow you to boil water to make beverages or cook rice, and it'll ensure that your entre doesn't become a charred brick as soon as you take your eye away from the kitchen for a minute or two. 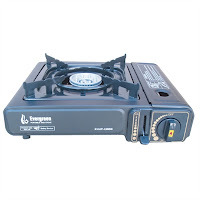 A butane stove is easy to assemble and disassemble, and doesn't require any wood or other burning materials. You'll use it in conjunction with one of these disposable butane gas canisters, which can be refilled with the help of certain adaptors. Portable stoves are easy to clean and store. Think the Swiss Army Knife on steroids. If you think you don't have a lot of use for such a complex tool, think again. While they may look like they require the handling or an expert outdoorsman, Gerber knives and multi-tools are a must-have on the campground, whether you've a professional or a novice. camping. 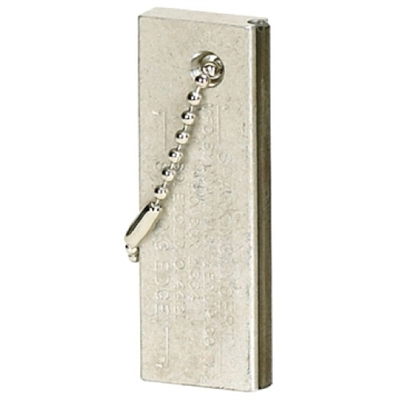 They can look intimidating, but consider that they're great for basic tasks such as tightening a lose screw, opening a bottle, picking something out of a tight crack, measuring a space or cutting something open. You don't have to be a wilderness expert to utilize a multi-tool in this way, and it'll save you hundreds of frustrating trips to and from your car or toolbox to keep one of these in your pocket. Keeping a multi-tool with you while camping helps you to prepare for the worst without a ton of extra equipment. 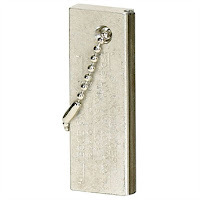 These little tools can take on a variety of big jobs to save your time and sanity, and you'll be glad you have one if things ever do go wrong. These knives are similar to multi-tools with the exception that they focus heavily on the knife-aspect of things. Knives tend to be even more intimidating than multi-tools for novice campers, but don't worry: these blades aren't intended for protection. While having a knife in a life-or-death camping situation is obviously more ideal than, say, not having a knife, we know that 99.9 percent of camping trips won't call for violence. So why bother bringing a knife? Knives help you to prepare and eat food, cut kindling for a fire or rope for the tent. If you plan on fishing, you'll need a knife. Is there anything a knife can't do? With a creative approach, your knife can handle anything. least one scraped knee or splinter. 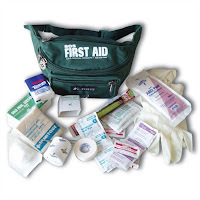 We recommend keeping a permanent first aid kit (along with a small fire extinguisher) in your car at all times so that no matter where you go, you're prepared for life's little hiccups. A small fanny pack stocked with the essentials is a convenient way to keep what you need on your person without taking up extra room in your pack. We also recommend carrying eyewash for those pesky dust or ash particles that are a part of every camping experience. If you want to take your camping or wildlife experience to the next level, you'll need more than the proper tools; you'll need proper preparation. 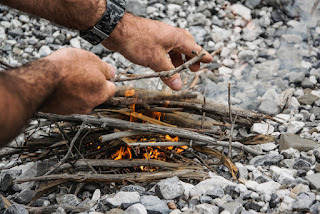 There are plenty or websites and books on the topic of minimal and wilderness camping, but when it comes to emergency preparation, we prefer a hands-on experience. The 2-day wilderness first aid course will teach you everything you'll need to know about making proper assessments, treating cold or heat-related injuries, taking care of broken bones or spinal injuries and more. You'll have a superior hands-on experience and receive expert advice and answers to your questions along the way. Remember that you need to be CPR certified in order to take this course and be at least 14 years of age. We offer training classes throughout the year, or check with American Red Cross to find a class that’s starting now. This course is based on the Boy Scouts of America Wilderness First Aid curriculum and doctrine guidelines, and uses OSHA's best practices for workplace First Aid training programs. Ready to try your hand at an advanced skill today? The fire starter is one of our favorite camping tools because it is easy to use, affordable and small enough to tuck away in any pocket. You learned it on Lost in Space: Magnesium burns hot and is unaffected by water! 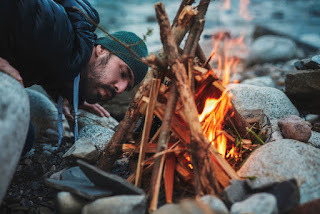 Never mind the logistics of melting ice with a magnesium fire, all you'll need for your camping trip is one block of this fire starter and, of course, your knife or multi-tool. This little guy isn't just a cool way to impress your friends, it'll be your lifesaver in an emergency. This fire starter will let you build a fire with little other resources at hand. If you're considering taking your camping experience to the next level, be sure you check out our article on fire safety and wildlife fire prevention. 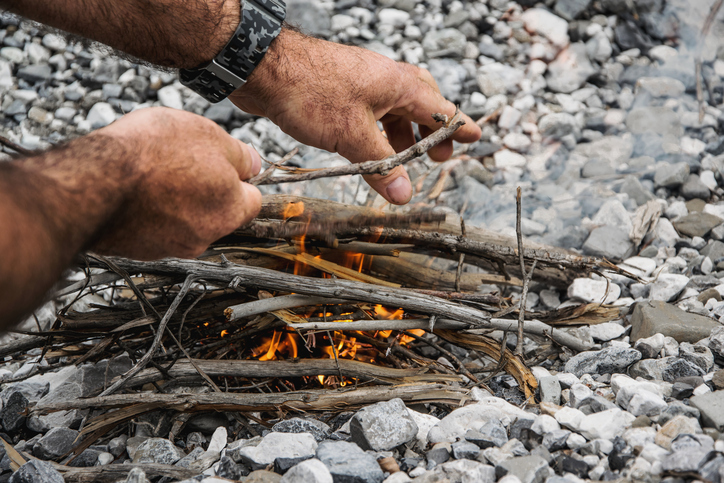 To successfully start a campfire, you’ll tinder, kindling and firewood. Tinder is the stuff that helps you start your fire. It's super dry and will burn up quickly, such as dry leaves and dry grasses. One major advantage to using a fire starter is that it will allow you to work with damp tinder. Kindling consists of small sticks that will help you to grow your fire. Make sure you have plenty of kindling to get a sizable fire going before laying on any large firewood. Start with a small amount of tinder and surround it with a "teepee" of kindling. Take your magnesium block and, using a knife, scrape off some shavings of magnesium into your tinder. These shavings are incredibly flammable and will burn very hot and very quickly once they come into contact with a spark. Now, use the fire starter to create a spark. Keep adding kindling to grow your fire. Once your fire is burning strong and you can feel the temperature rising, it'll be time to add larger logs one at a time. You can continue the "teepee" method by laying blocks of wood against one another or you might prefer a pyramid approach. Don't add too much firewood at once. Making a lasting fire takes patience. Remember that no matter where you are, building your fire safely so that it can't burn out of control should be paramount. If you don't have a fire pit to work with, you'll need to create your own. Keep in mind that you should only be building your own fire pit in an undeveloped area in case of an emergency. Build a fire to stay warm, deter wildlife or to signal for help. Do you have a favorite camping tool or safety tip? Let us know in the comments below.